Project overview, goals, rules-requirements-constraints, design process, the systems of the car. 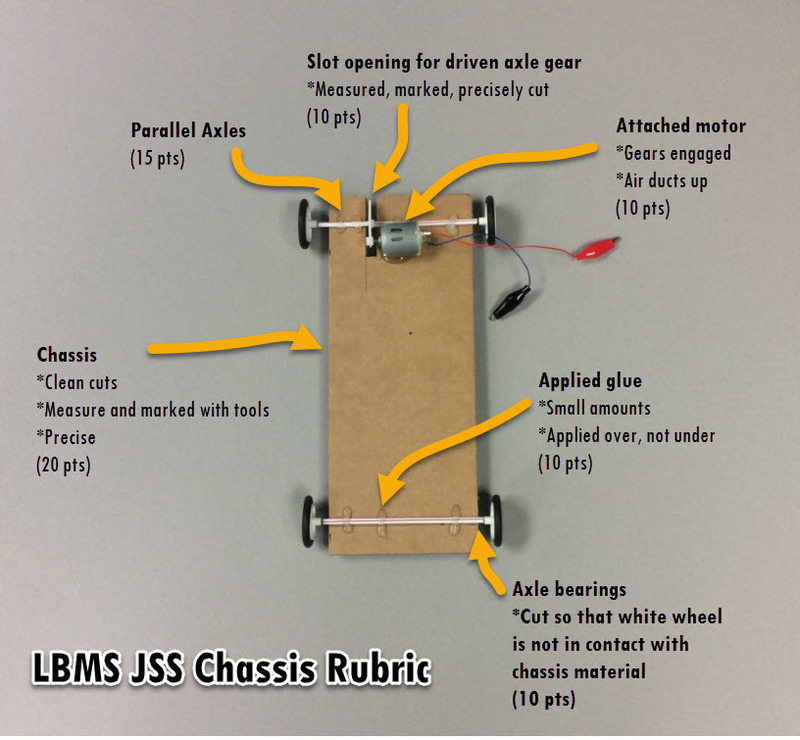 Please note these are generally the steps LBMS takes to design, test, and race the cars in a 2 to 3 week period. the chassis and what material it was made out of. the solar panel structure and if it has a flat, fixed or has an adjustable angle. How the individual ‘systems’ of the car get assembled? What material was used as the axle bearing? How much does the car weigh in grams? Think you’re done? Look at these past student examples. Do NOT go on until you show the teacher your sketches – it’s a grade! 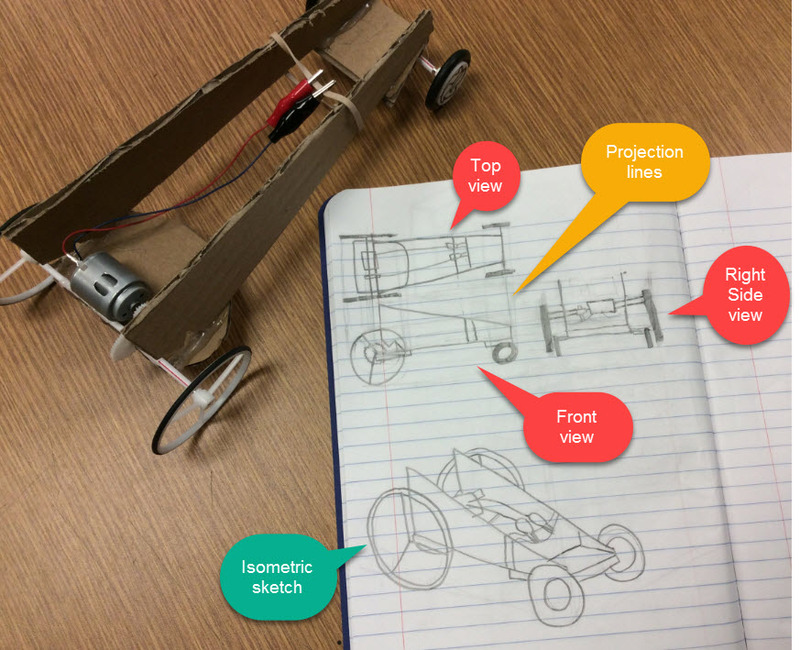 What can we learn from cars made by previous students. Is there wisdom in the data? What can we learn from the best cars? The worst cars? Together, watch the following movies – #1 and #2 and #3. Perhaps, make a list in your composition book of ‘other things’ that could affect the performance of a car that you couldn’t deduce from the data. Now, do some searches online, looking for pictures of JSS cars from other students around the country. (5 to 10 minutes). Grab a picture of a real ‘cool’ car. Turn it into your Google Classroom assignment along with the web address of where you got the picture. NOTE: How can you ‘take’ ideas from other cars and alter them, evolving that idea to make a better design? Also remember – don’t STEAL. On a blank page in your own composition book, each person creates a minimum of 9 small ‘thumbnail’ sketches – focusing on a ‘TOP VIEW’ of the chassis’ shape as well as where axles/wheel will be placed. Be creative! Make the sketches ‘small’ and on one side of the page. Click on the picture to the right for examples from past students. Try to make lines smooth and aerodynamic, like a bird or airplane. Each of the team members should have DIFFERENT ideas/sketches – meaning, don’t copy off each other. You don’t have to label anything, but you certainly can, if you wish. Next, on the facing side of the page, each person pick which thumbnail would be their own best design (from their OWN 9 thumbnail sketches) and sketch a larger, more detailed sketch of JUST THAT ONE. This should be a pretty good sketch. If you can, do an orthographic and/or isometric, but you don’t have to. First – look at each other’s best design. Discuss all pros and cons of your designs and pick which one you will start building as your first prototype. Where will you get materials? What team members will bring what? As a group, watch the movie on utility knife safety (click on picture). When you’re done, take the quiz Each person needs to take the quiz individually and MUST get 100% correct. Keep taking the test until you get 100% correct. In the next steps, you’ll be using measuring and cutting tools to make your chassis according to your plan. Be as precise as you can using these tools. Remember that the instructional movies and the live demonstrations are there to help you do your best. Rewind movies to see over again if you don’t understand. Ask the teacher questions. Don’t be afraid to start over again. Learn from your mistakes. Once you learn the basics, doing something over again takes less time. Click on the picture to ‘preview’ how you’ll be graded. Step 6: Measure, mark, cut the chassis. Take your materials and layout what needs to be cut. Layout so that the very least amount of material is being used. (to reduce waste going into landfill or that will have to be recycled). Layout/cut the the width and then the length of chassis with rulers and T-squares. If your chassis has a ‘shape’ other than a rectangle, cut that out now. Stop to think! What gears will you be using and why? What’s the math behind it? Can you try different gear combinations (resulting in different gear ratios). How do the size of wheels relate to the gear ratio? NOTE: Before gluing, you MUST have the teacher check your work. Let the glue dry and with a battery pack test your car. Observe any turning, how fast the car goes, how quickly it accelerates, and any possible friction issues. Look at past cars and their solar panel structure. Remember – WEIGHT – one of the biggest factors. Design with simplicity in mind. Trade offs: will your car go faster if you make the panel holding structure horizontal (least weight) or at an angle (what angle?) or adjustable? Interjection: Aerodynamics. What if the race is on a windy day? Will your car flip over if the wind grabs a hold of it? What design ideas can you implement to reduce any ‘drag’ caused by wind. Trade-off: One contact point system or two? If only one, which end of the car should it be on? Note: The guidance system is critical. Some cars that run incredibly on their own, won’t run at all when on the race wire. Point? Spend time designing and testing your guidance system. LBMS Line Test: You team must prove that you can attach your car to the race wire (test race track) in under 30 seconds and that the car runs the entire 10 meters of the test track. Using the online data input form, submit your car’s data. Note: This MUST be done BEFORE the race, or your car is automatically disqualified.